Will is determined to uncover the truth about the Berlin job. Framed for multiple murders, the former spy has gone deep underground to evade his enemies and the Feds. But honor and loyalty to his colleague thrust him into danger once again. When FBI special agent Marsha Gage discovers that Cochrane—one of America’s Most Wanted—has resurfaced, she immediately launches a manhunt, and she won’t stop until she brings the former CIA/MI6 operative in. With members of the original Berlin team turning up dead, Cochrane must use all his training and formidable skills to outmaneuver the FBI and uncover a shocking conspiracy that will rock the foundations of our nation… if he can stay alive long enough. Ultimately, I loved it and you will, too! Will Cochrane is one of my favorite fictional spies, but I was pretty upset with the way A Soldier’s Revenge ended last year. Don’t get me wrong, it was a fantastic book, but I worried it painted Will into a corner and would end the series because what do you do with a spy whose face is all over the international media? His career was over and his future was shattered. So I was unsure how The Act of Betrayal would play out. The beginning is heartbreaking with Will’s life in shambles. About a third of the way through it, I told a friend, and fellow Cochrane fan, how upset I was that this is how his story will end and it didn’t do Will justice. But I was holding out hope that the talented Matthew Dunn would have a few surprises for me (He did!). Anyway, Will is drawn out of hiding by a trusted friend who needs his help and once again finds himself on the run for a crime he didn’t commit. With so many of his friends and allies lost in A Soldier’s Revenge, Will has few people he can rely on. He’s never needed people to survive, it just makes his job easier if he has help and his life happier as well. And thankfully there are a few wonderful people who are both talented and trustworthy who come to his aid. Ultimately, Will proves he is smarter and more cunning than those plotting against him. I’m thrilled with the ending of this one and hopeful it sets Will up for many future adventures. If you haven’t started the Spycatcher series yet, it’s a fantastic one to add to your reading list. I promise you won’t be disappointed. 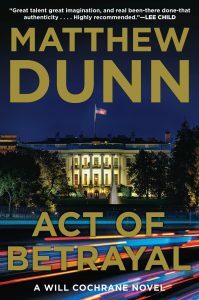 Excerpt from Act of Betrayal by Matthew Dunn. Copyright © 2017 by Matthew Dunn. Reproduced with permission from William Morrow. All rights reserved. This is a rafflecopter giveaway hosted by Partners in Crime Virtual Book Tours for Matthew Dunn and William Morrow. 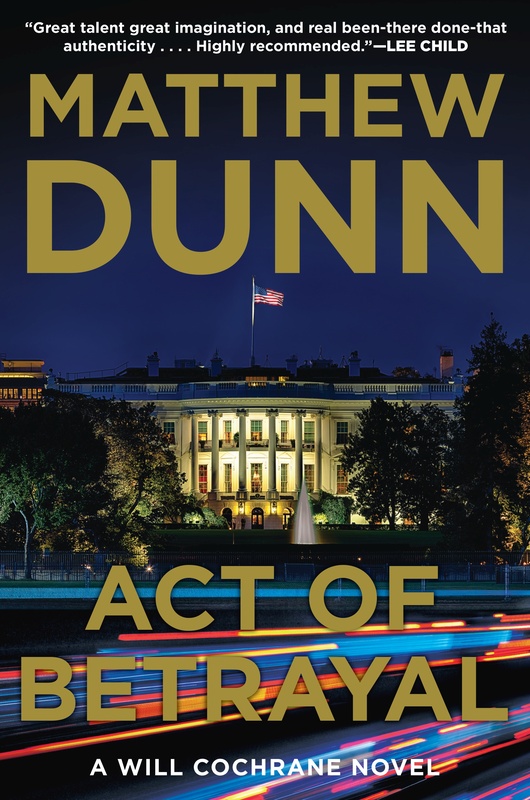 There will be 5 winners of one (1) print copy of ACT OF BETRAYAL by Matthew Dunn. This giveaway is open to US & Canada addresses only. The giveaway begins on October 23 and runs through November 30, 2017.